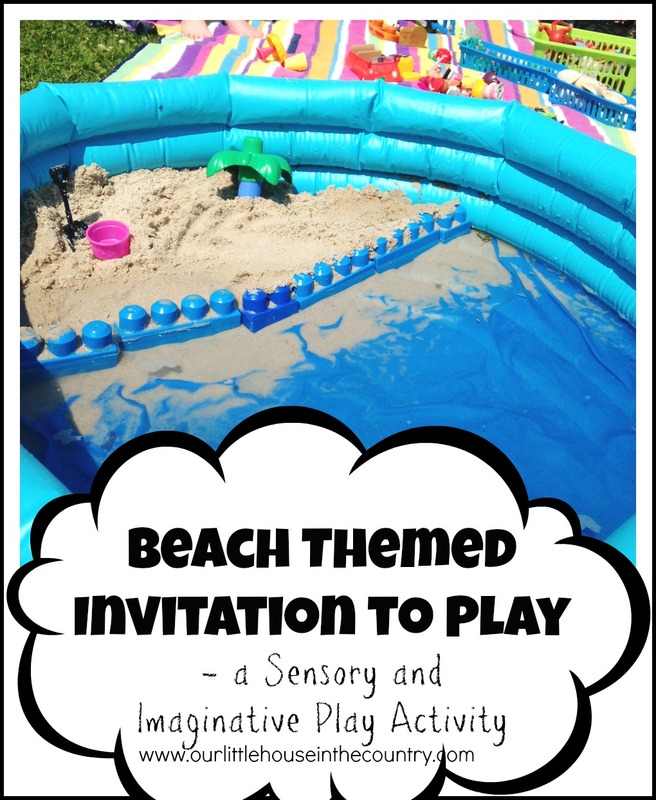 A Beach Themed sensory play activity was on our 100 Days of Summer Bucket List and this week we had we had the opportunity to cross it off our list and have a whole lot of fun doing it! 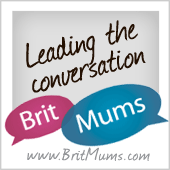 So, what is an invitation to play (you may have seen this term used on this blog and elsewhere before)? Simply, it is arranging an activity in an attractive manner that will encourage a child’s curiosity, allow opportunities for exploration, independent play and participation in a meaningful, purpose and sensory way. It should invite the child to want to play and use their imagination. Of course it should also be age appropriate and kids should be encouraged to play as freely and interactively as possile with the materials provided. In this case, I set out a picnic blanket with little collections of item in colourful baskets that I regularly use for similar activities. 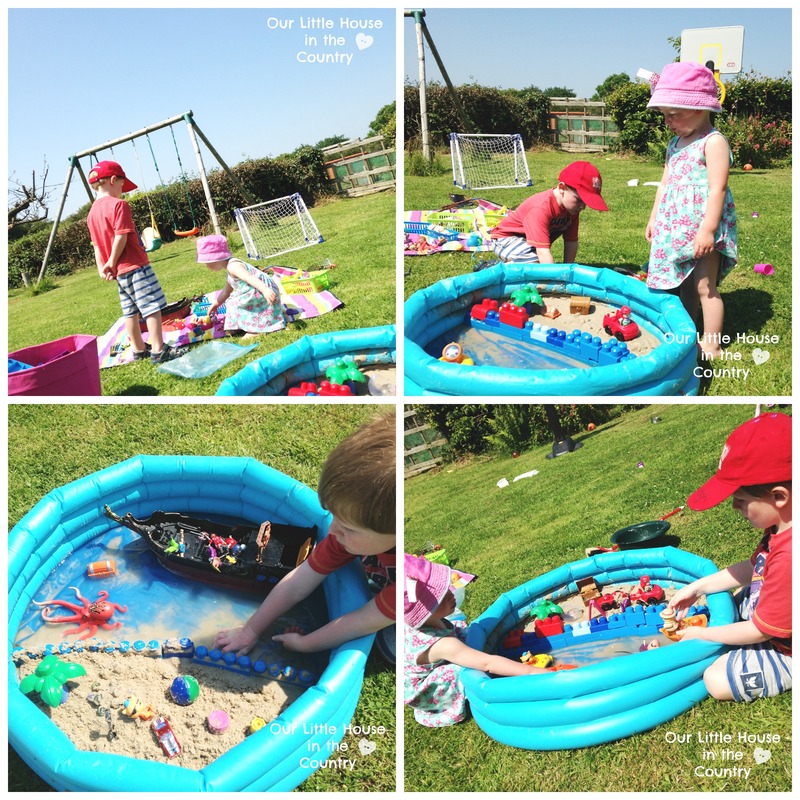 We had shells, mini sand toys, plastic characters, sealife and animal toys, fake plants and flowers, a pirate ship and pirates. 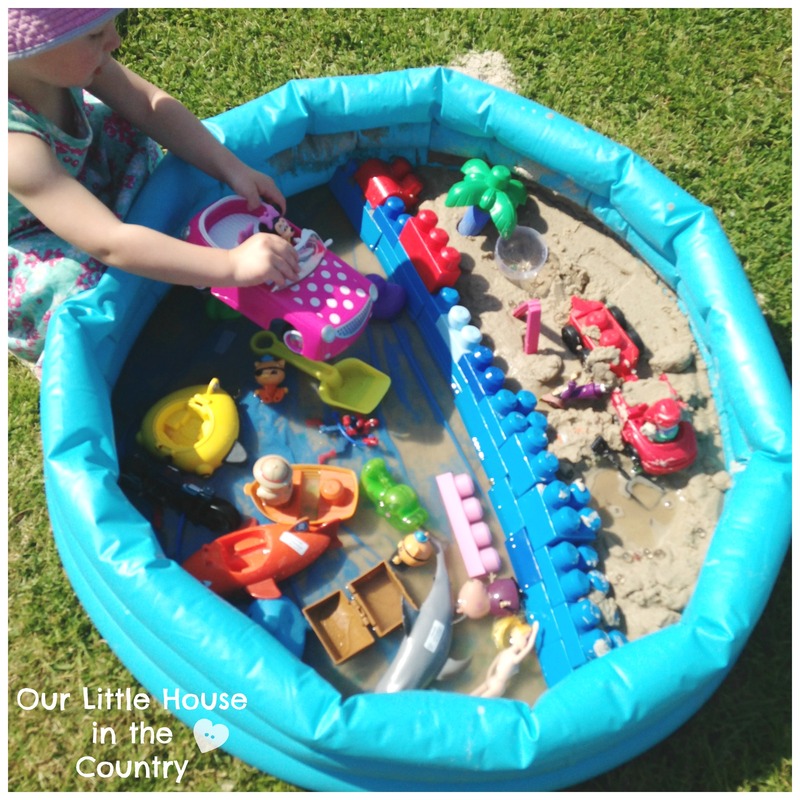 I also set up a paddling pool as the setting for this activity – I filled half of it with sand and added water to the other half. For the first time, we also added water beads, for extra sensory fun! Oodles was taking her nap when I was setting up, but Doodles could barely contain his excitement at what I was doing. He took off inside, searching for whatever he could find to use for his beach. I was so impressed when he returned with lots of large blue Mega Blocks to separate the water from the sand to avoid the sand getting to soggy!!!!! What a great idea! While I had intended for the two of them to play together for this activity, I just had to let D dive straight in, he was full of ideas! He was fascinated by the water beads, he spotted them on the shelf in the playroom a few weeks ago and was dying to know how we were going to use them. Straight off, he decided that the water beads were poisonous jelly fish! He built a wall with the blocks and covered it with sand in an attempt to stop all of the sand and water mixing and it worked very well. 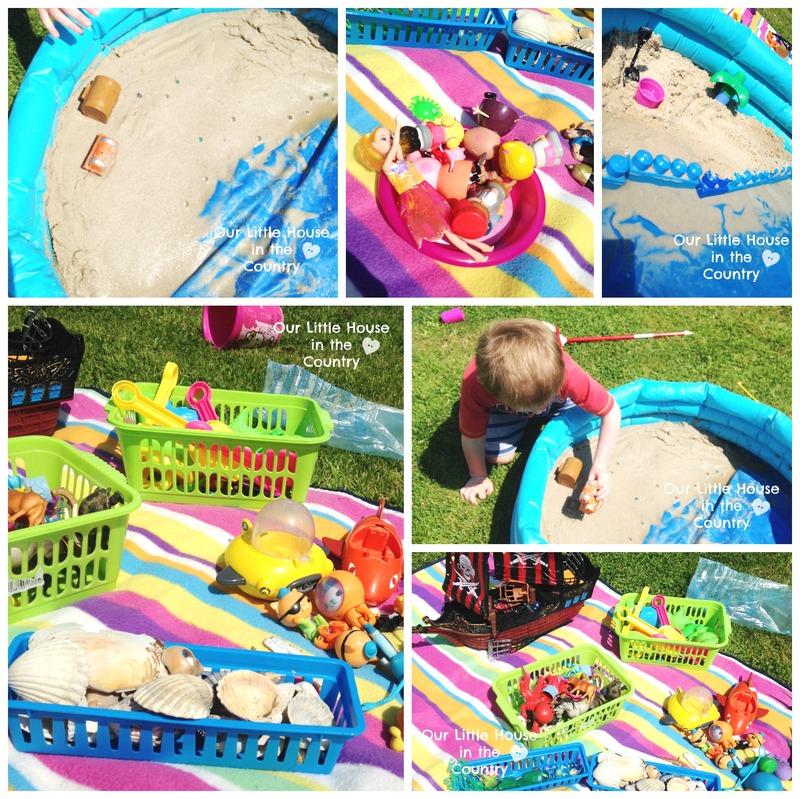 He buried two treasure chests in the sand, planted a palm tree, added a couple of Octonaut figures along with a beach ball (juggling ball) and a mini bucket and spade (play dough toys). I was sitting nearby, sunbathing with my book(and camera), pretending to read but really I was enthralled by his imagination in action. I have no idea how long he played for. He added the pirate ship and a giant squid and killer shark. There was mayhem on the beach as the shark and squid try to attack the swimmers!!!!!! As soon as O woke up she joined him! She too, disappeared inside to find things to use, and arrived out with her Minnie Mouse car, a tiny doll, Peppa Pig and Mummy Pig! This little lady played and played and played for hours. Even after her shower later that evening she escaped out to the garden for one last play with her beach. The beach got lots of use over the following 2 days. 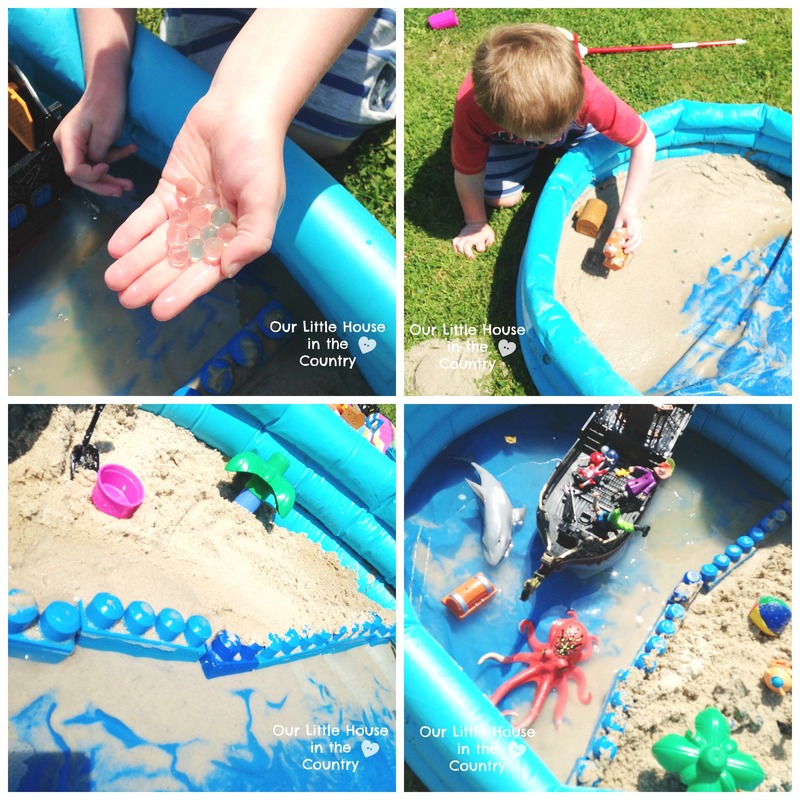 This was a thoroughly enjoyable and successful activity and while for the vast majority of the time they played independently, I couldn’t help but join in from time to time – there is something so alluring about sand, water and of course the magical water beads!!!!! This is definitely worth trying! Have you set up an invitation to play recently? What theme or materials did you use? Let us know in the comments or on Facebook! Love them, really great squishy slimy fun, got them in a pound shop but saw them on Amazon for great price in bigger quantities!